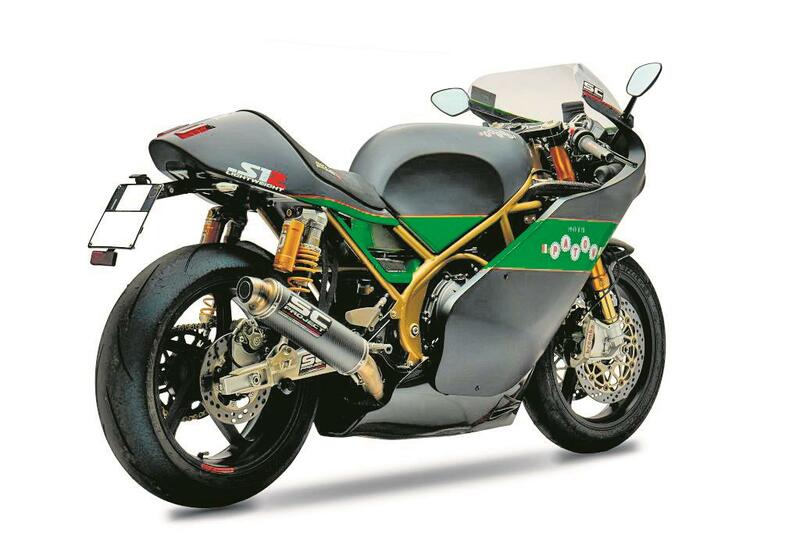 Paton have launched a special version of their S1R Lightweight to celebrate their 60th anniversary as a bike constructor and Michael Dunlop’s Lightweight TT win. It features a new matt black and green paintjob like Michael’s bike and also a new SC Project titanium exhaust system. The previous one suffered from ground clearance problems, which you can see in the below image. Paton’s S1R Lightweight is proof that when it comes to high performance motorcycles a sweet chassis trumps big power every time. Created as a replica of Michael Rutter’s Lightweight TT-winning racer, it incorporates high-end chassis parts with exquisite build quality and a stunning retro style that takes you right back to Paton’s late-60s racing heyday. It’s designed to ape the looks and style of a classic, but hidden behind that curvy fairing is the bullet-proof engine and electronics from a Kawasaki ER6. It’s an alluring combination – especially when at 158kg wet, it weighs 50kg less than the bike it is based on. First seen in 2014 as the S1 Stradale, the old road bike had conventional forks and brakes and wire wheels, but the S1R now boasts more power, fully-adjustable Öhlins forks, Brembo M4 monoblock calipers, OZ Piega wheels and a new titanium exhaust system from Italian firm SC Project. SC bought Paton last year and are starting to invest heavily in the brand. 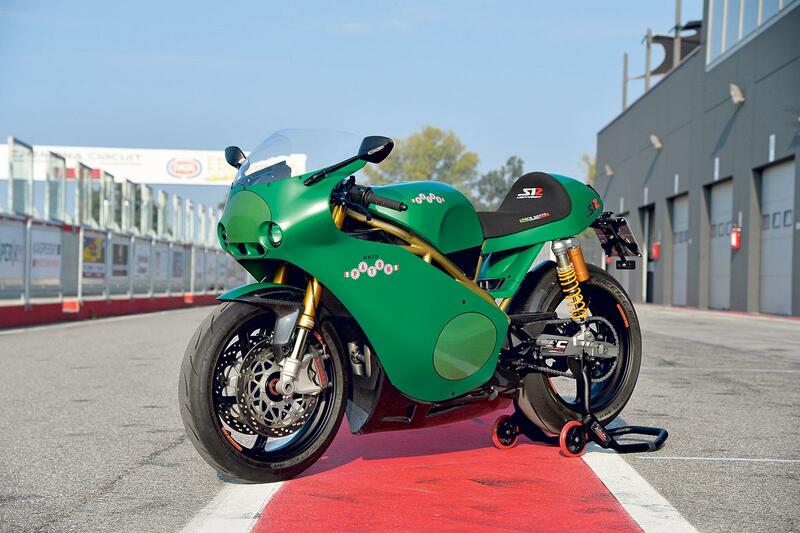 These changes, plus a chassis that uses the years of experience that Paton have with classic racers, mean the Lightweight is astounding on road and track. 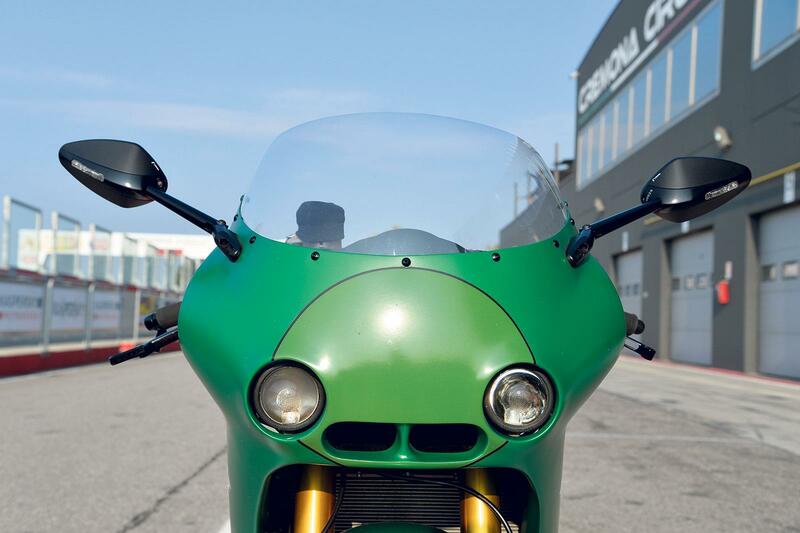 We tested the bike on Northern Italy’s 1.8-mile Circuit Cremona and briefly on the roads around the circuit and the Paton combines brilliant handling with a confidence-inspiring feel that lets you get the most from it. Riding it on track is a cultured, joyful experience. Tucked in, looking through the bubble screen, you can guide the S1R with your fingertips. The steering is light but accurate and gives the bike a playful, excited character. The S1R turns as easily as you’d expect a 158kg bike to, but has a neutral, linear character where every input is rewarded with a proportional response. It’s inspiring and promotes big lean, big corner speed and taking advantage of the grippy Metzeler Racetecs. Want to turn a little tighter? No-problem – a bit more pressure in the inside bar gives you exactly want. Want to ride around the outside of a slower bike? A mid-corner line-change doesn’t faze it, even when, knee, boot and bellypan are dragging. Fast corners, slow corners, it’s all the same – a lesson of momentum conservation and a pure riding experience that isn’t corrupted by having to lay down 180bhp. That 650 Kawasaki twin does a decent job of punting the Paton around, too. Paton’s race team also tuned the motor that Rutter used his for 2017 TT victory and offer a selection of engine tunes for the road bike. The engine in this bike is mildly breathed-on, with high-comp Pistal pistons, some minor head work, a Power Commander and SC Project’s titanium exhaust. Producing 80bhp, it’s lusty, full of midrange and packs enough top-end power to be fun. On Cremona’s 900-metre straight, the S1R pulls hard, quickshifter happily allowing you to feed gear after gear, clocking about 125mph before you haul on the Brembos for the hairpin. Braking performance is stunning, with exquisite lever feel from the RCS19 mater cylinder. With its trackday credentials confirmed we were offered a brief ride on the road. Despite being based on a racer, the riding position is roomy enough. The wide bars are high enough for low-speed riding and while the seat, although thin, is quite broad. Cutting through the rural twists and turns of the Cremona countryside, that suspension comes into its own, offering a heady mix of ride-quality and support. Each bump is soaked up and that nimbleness and light steering combine for huge fun. This may be a low-volume road bike, but the fuelling is smooth and works perfectly from low rpm, vibes aren’t any worse than a standard ER6 and the Rizoma mirrors are more useful than on any Ducati sportsbike. Even that hand-beaten tank has enough for 120 miles. It’s all well-judged from a small company and a contrast to most Bimotas and even MVs and proof that the sportsbike world’s obsession with power is a blind alley. What makes this bike so much fun is its exploitability on the road – you can work it though the gears without worrying about prison. Everyone should make a road-going supertwin. There are a couple of sticking points: firstly – I’d have liked to have seen the bike with different clocks, either a set of retro-style dials or a modern race dash. Both would feel more special than the ER6 unit currently used. But the big problem is price. At £25,300, it costs more than a Panigale 1299. But comparisons like that are missing the point – this is a hand-built, low-volume bike with exquisite chassis parts and race-winning heritage. But if you can afford one and value corner speed and craftsmanship above straight-line performance you’ll adore it. Stunningly-built, bespoke and exclusive, the prospect of owning a Paton will be mouth-watering for well-heeled riders who understand the art of cornering. If you’re not part of the ‘mine’s bigger’ rat race, this is perfect and works well on road and track.